PETALING JAYA: Headwinds from the gloomy global economic and financial fronts, particularly in the United States and the eurozone, will pose challenges to the performance of the local real estate investment trusts (M-REITs) this year. 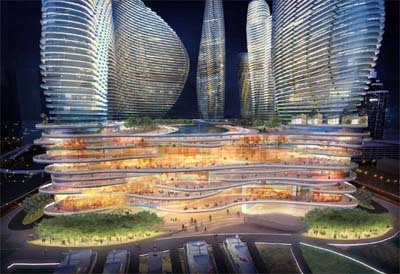 An artist’s impression of the Resorts World Miami, Florida. The Greater Miami Chamber of Commerce’s move to endorse casino resorts in South Florida shows the importance of having more income generation streams to boost the sluggish economy in the US. The odds have turned to Genting Malaysia Bhd's favour to build a US$3.8bil (RM11.4bil) casino and hotel complex in Florida after a state Senate committee voted to allow the proposal to be debated by the state's lawmakers, analysts said. The bill would deliberate on the issue of liberalising non-native American casinos. While the outcome would only be known in a few months, analysts say the move indicated that people supported the idea of legalised gambling to generate revenue for the economy. The decision was positive for Genting as Florida may have as many as three Las Vegas-style casinos, with dealers and table games in addition to slot machines. Currently in Florida, state laws only allowed casino gambling to resorts operated by native American tribes and slot machines at horse and dog race tracks. “Genting would be well-positioned to secure the casino licence as it was the first to detail out its plans last year before any development has taken place,” said Alliance gaming analyst Cheah King Yoong. “It's still early days and we still don't know the outcome. However, it's definitely good news for Genting. 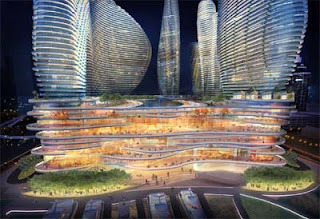 It has quite an ambitious plan in Miami,” said a gaming analyst from Kenanga Research. Competition is hot too, as analysts say MGM Resorts International, Las Vegas Sands and Wynn Resorts Ltd are also interested in setting up casinos there. Genting has submitted a master plan which showcased hotels, convention and entertainment centres, restaurants, retail and commercial facilities and residential towers on a waterfront site. It is widely known that the measure is currently opposed by Walt Disney Co, the world's biggest theme-park company, whose flagship Walt Disney World is near Orlando, just over 300km away. Another gaming analyst added that Genting may have won the battle, but it could be losing the war. “The bill has not been finalised. What if they allowed a lot more casinos to set up shop? So although Genting gets the licence, it might still start off at a disadvantage,” said the gaming analyst. “Furthermore, with Phase 2 of Genting New York venture coming up and estimated at a cost of more than US$4bil (RM12bil), should Genting be awarded the casino in Miami, how is it going to fund it?” asked the analyst. Last week, it was announced that Genting had entered into a non-binding letter of intent with the New York State Urban Development Corp to consider developing an integrated complex next to its existing facility, Resorts World New York (RWNY) in Queens. The new extension includes a convention and exhibition centre, up to 3,000 hotel rooms and an expansion of RWNY's casino. A binding MoU is expected to be inked by Nov 30. “The timing of the developments will be important. Funding for both the developments in New York and Miami concurrently would mean spending close to US$8bil (RM24bil). I am sure Genting will work its way around that. “However, investors are used with Genting being in net cash position. If debt levels were to rise to above 50%, then that would be something to ponder on,” said the gaming analyst. Meanwhile, Cheah said the Greater Miami Chamber of Commerce's move to endorse casino resorts in South Florida was a huge plus point in helping to broaden the state's gambling laws. “The endorsement by the largest business group in South Florida shows that the major business leaders understand the importance of having more income generation streams to boost the sluggish economy in the US. As such, odds are turning favourable to Genting 's Miami venture,” said Cheah. Cheah believes that the market has not priced in the potential of Genting benefiting from the liberalisation of the gaming sector in Miami and the emergence of Genting as a global gaming giant. The gaming analyst said that it was still early to talk about earnings potential should Genting be awarded the casino licence as this would be the first time a full-fledged casino was being constructed. However, HwangDBS analyst Yee Mei Hui said that Resorts World New York was expected to contribute 16% to Genting Malaysia's 2012 earnings. She is estimating Genting to make RM1.75bil in net profit in 2012. 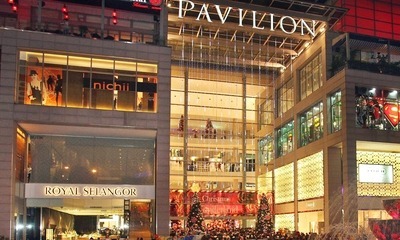 For the nine months to Sept 30, 2011, its net profit was up 17.95% to RM1.08bil while revenue was up 63.26% to RM6.16bil. Genting gets some 90% of its revenues from its mainstay travel and leisure business in the Genting Highland Resorts. KUALA LUMPUR: Sentoria Group Bhd is set to increase its accommodation capacity in Bukit Gambang Resort City (BGRC) by the third quarter of 2012. Sitting on a 547-acre land, BGRC is one of the largest integrated resort cities in Malaysia featuring multiple attractions in a single location, including the popular Bukit Gambang Water Park and Active Academy, as well as meetings, incentives, conventions and exhibitions facilities and accommodation. In a statement today, Sentoria said at present, BGRC had 998 accommodation rooms in its Caribbean Bay Resort. "The group is currently developing Arabian Bay Resort which would increase its room capacity to 1,864 rooms in total. "Arabian Bay Resort has an estimated gross development value (GDV) of RM92 million and is targeted for completion by September 2012," Head of Public and Investor Relations Nasiruddin Nasrun said. He said barely two years after opening its doors to the public in mid-2009, Bukit Gambang Water Park saw an increasing number of visitors, currently recording more than one million visitors over the past two years. Sentoria is slated for listing on Bursa Malaysia in the first quarter of 2012. JOHOR state investment company Johor Corp will spend up to RM40 million to upgrade all its hotel assets to cater to the expected increase in tourist arrivals, which is driven by the opening of several attractions in Iskandar Malaysia. By end of this year, the RM350 million indoor theme park in Puteri Harbour, which is developed by government investment arm Khazanah Nasional Bhd, will open its doors. In Nusajaya, Legoland Malaysia, which is being built at a cost of around RM750 million, is expected to open in September. For the first nine months of last year, tourist arrivals through the state's entry points rose five per cent to 12.5 million. JCorp Hotels & Resorts Sdn Bhd deputy chief executive officer, Muhamad Mazlan Ali, said the hotels' upgrading work would start with the Puteri Pacific Johor Baru. "The hotel, which opened in 1990, needs some refurbishments. To stay afloat, we have to upgrade our properties," Muhamad Mazlan told Business Times. He said once the refurbishment exercise was completed in about a year or two, the company would review its pricing strategy upwards. Currently, the average room rate in the Johor market is about RM180 a night. JCorp Hotels, the hospitality arm of Johor Corp, owns and manages five properties in Johor. Besides the Puteri Pacific Johor Baru and the Persada Johor International Convention Centre, it also owns Sibu Island Resort, Selesa Johor Baru and Selesa Pasir Gudang. The company also has a property in Negri Sembilan called Selesa Port Dickson. The six properties are worth as much as RM600 million. There are more than 4,000 rooms available in the two to five-star categories and this is expected to double by 2014. However, they might not be sufficient to meet demand, he said. "We expect room demand to increase with the expected influx of tourists and attractions. 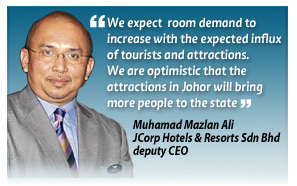 "We are optimistic that the attractions in Johor will bring more people to the state. "With more universities and colleges opening at EduCity, we can expect a large number of international students, too," he said. EduCity is a fully integrated knowledge-based hub comprising world-class universities, industry-centric research and development clusters, international schools and colleges, as well as conference and exhibition amenities. 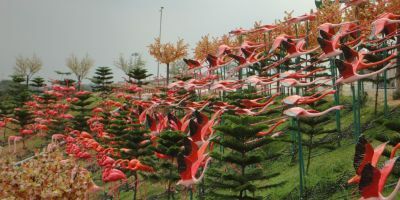 Taking off: Flamingos in flight in i-City. BEAUTIFUL red and pink flying flamingos have “flocked” to i-City in Shah Alam, lighting up the nightscape with their beautiful glow. Using state-of-the-art technology, the synchronisation of lights and movement simulates a flock of flamingos flying around i-City as part of its latest LED attractions this Chinese New Year to welcome visitors with good luck. Flamingos signify wisdom and their presence at i-City is hoped to bring wisdom and prosperity in the new lunar year. The pre-tax profit of Axis Real Estate Investment Trust (Axis-REIT) decreased to RM31.98 million in the fourth quarter ended Dec 31, 2011 from RM40.99 million in the same quarter last year. In a filing to Bursa Malaysia today, Axis-REIT said revenue rose to RM29.81 million from RM26.6 million previously. In view of the current satisfactory performance, the management is optimistic that the company will be able to maintain its current performance for the coming quarter and the rest of the financial year ended Dec 31, 2012.